Catalytic asymmetric ketene cycloadditions establish four- or six-membered rings via the formal cycloaddition of a nucleophilic ketene or vinylketene with an electrophilic two- or four-atom π system. 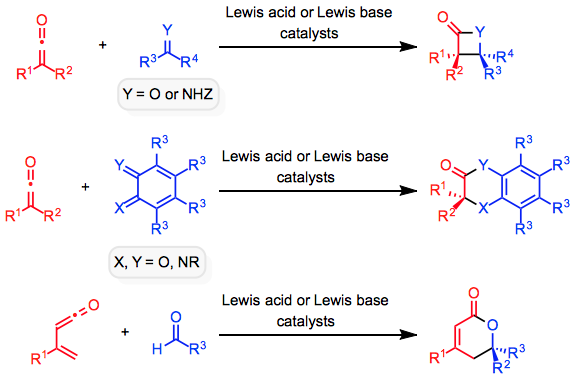 Chiral, nonracemic Lewis bases and Lewis acids have been employed as catalysts for these reactions, which may or may not occur through pericyclic reaction mechanisms. Ketenes are ideally suited for engaging in cycloadditions in an antarafacial manner because of the linear geometry of the central carbon atom. Hence, ketenes participate in thermal [2 + 2] cycloaddition reactions that are forbidden to many other classes of substrates. They may also engage in [4 + 2] reactions with electrophilic dienes. Conjugated vinylketenes can serve as electron-rich dienes in [4 + 2] reactions with electrophilic dienophiles as well (Eq. 1). Because of the electron-donating nature of the carbonyl oxygen in ketenes, they are best considered the nucleophilic partner in these reactions (see "Mechanism and Stereochemistry" below). Many of these reactions occur through stepwise, rather than concerted mechanisms. Catalytic, asymmetric variants of these formal cycloadditions may involve either a Lewis basic or Lewis acidic catalyst (or both). 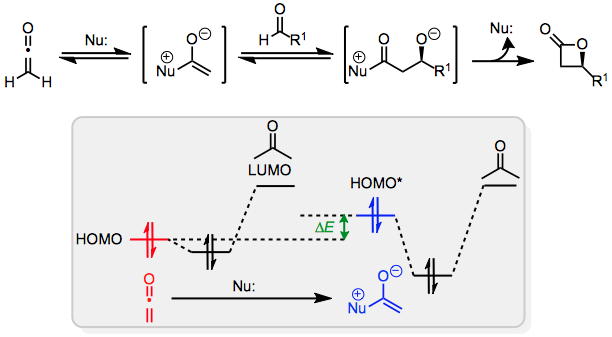 Lewis bases add to the carbonyl carbon in ketenes, establishing a zwitterionic intermediate with greater nucleophilicity than the corresponding ketene. 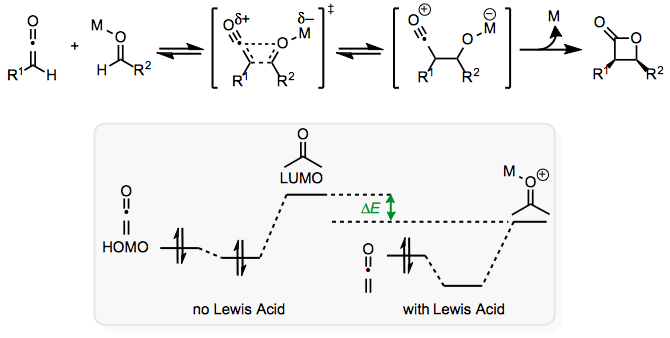 Lewis acids coordinate to the electrophilic partner, lowering the energy of the LUMO and facilitating nucleophilic attack by the ketene. The scope of ketene cycloadditions has benefitted substantially from the development of a large number of catalysts for the reaction. Ketene or substituted ketenes (pre-formed or generated in situ) react with a wide range of aldehydes and imines under catalytic conditions. Stereoselective ketene-carbonyl cycloadditions followed by β-lactone ring opening provide a useful synthetic alternative to catalytic, asymmetric aldol reactions. Two transition states have been proposed for the pericyclic [2 + 2] cycloaddition of ketenes with ketenophiles. Both account for the observed diastereoselectivity of cycloadditions involving prochiral ketenophiles. As a result, distinguishing between the two experimentally has not been possible. The [π2s+π2a] transition state involves overlap between four p orbitals, two on the ketene and two on the ketenophile. The alternative [π2s+π2s+π2s] transition state invokes orbital lobes on the ketenic oxygen as well. Cycloadditions catalyzed by a Lewis acid typically involve coordination of the Lewis acid to a heteroatom in the ketenophile. The energy of the LUMO of the ketenophile is lowered as a result of this coordination. These reactions are characterized by significantly greater C2–C than C1–X bond formation in the transition state and may involve the intermediacy of a zwitterionic aldol-type adduct prior to ring closing. Lewis basic catalysts (most notably, tertiary amines) may add to the electrophilic C1 in the ketene, thereby raising the energy of its highest occupied molecular orbital. Following carbon–carbon bond formation, intramolecular acyl substitution results in regeneration of the catalytic Lewis base. This mechanism is universally stepwise. Surprisingly, this mechanism is also relevant to uncatalyzed [2 + 2] cycloadditions of ketenes and imines. The imino nitrogen first adds to the ketene, and subsequent 4π-electrocyclic ring closure yields the product β-lactam. The recognition that electrocyclic ring closure is the key stereodefining step in this reaction profoundly influenced the subsequent development of asymmetric variants. Most [4 + 2] cycloadditions involving ketenes employ conjugated vinylketenes as electron-rich dienes. Because of the electron-donating character of the lone pairs on the carbonyl oxygen, vinylketenes react similarly to electron-rich dienes such as Danishefsky's diene. The precise mechanisms of these reactions depend strongly on the dienophile. For example, alkynes react via kinetically favored [2 + 2] cycloaddition followed by a pericyclic cascade leading ultimately to phenols (58). 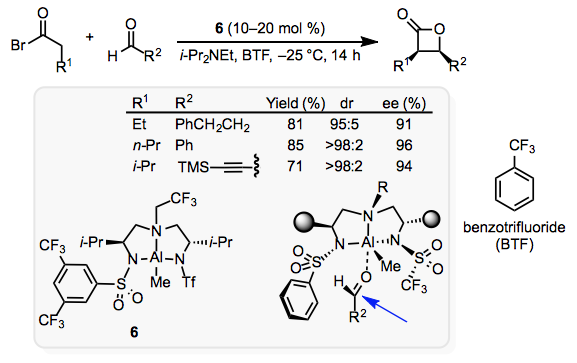 Electron-deficient olefins react with endo selectivity, suggesting a traditional, concerted mechanism for cycloaddition. Aldehydes and imines also react with silyl-substituted ketenes via concerted mechanisms. A large number of Lewis bases and Lewis acids have been employed as catalysts for ketene cycloadditions. The large number of catalysts developed for this reaction has led to a broad substrate scope. However, reactions of ketenes are subject to some general limitations. For example, dimerization of the ketene must be slower than cycloaddition—as a result, intermolecular reactions are often carried out with slow addition of pre-formed ketene or precursor. Care must be taken to isolate ketenes generated in situ from byproducts that may promote dimerization. The ketenophile must be very electrophilic and sterically unhindered enough to react rapidly with the ketene. Hence, aldehydes and monosubstituted N-tosylimines are the most common ketenophiles employed. Quinine and quinidine derivatives such as 1 and 2 are exceptional Lewis basic catalysts for [2 + 2] cycloadditions of ketenes with aldehydes (Eq. 6). The ketene is generated in situ via dehydrohalogenation mediated by Hünig's base, N,N-diisopropylethylamine. Stereoselectivity is high, although alkyl and aryl aldehydes react with opposite selectivity. Lithium ion is used as a Lewis acidic co-catalyst. Dimerization of ketenes affords synthetically useful β-lactones that can serve as masked enolates. O-silylated quinidine 2 is a useful catalyst for enantioselective dimerization of monosubstituted ketenes. 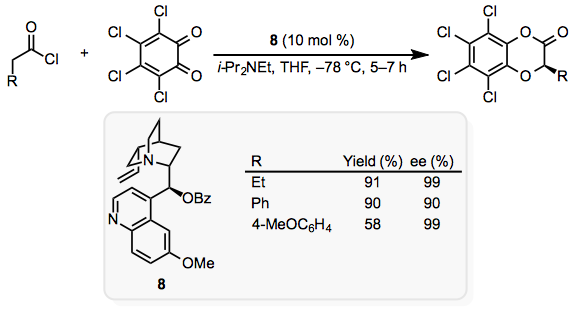 Ring opening with an amine affords β-keto amides with high enantioselectivity and no racemization (Eq. 7). Chiral, nonracemic N-heterocyclic carbene catalysts have been employed for the enantioselective dimerization of disubstituted ketenes. Chiral Lewis acids catalyze [2 + 2] cycloadditions of ketenes and aldehydes with high enantioselectivity. The Lewis acid coordinates selectively with the ketenophile because the ketenic oxygen is not as Lewis basic as a carbonyl oxygen; an "enolate-like" resonance form for the ketene illustrates this idea (see Eq. 5 above). Conformational flexibility associated with monodentate Lewis acids renders enantioselectivity difficult to predict and highly variable. 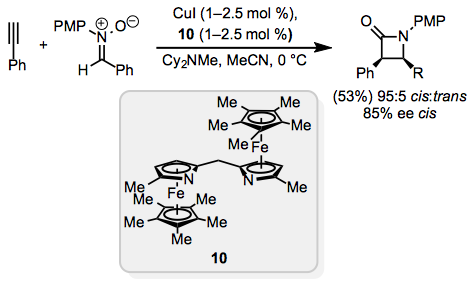 Cu(II)-bis(oxazoline) complexes can be used in conjunction with substrates containing an appropriately positioned Lewis base to achieve two-point coordination and more robust enantioselectivity (Eq. 8). Aluminium(III)-catalyzed acyl halide-aldehyde cyclocondensation (AAC) is a general method that avoids many of the limitations associated with the aforementioned reactions. A monodentate aluminum triamine complex catalyzes the cycloaddition of alkyl ketenes with aryl and alkyl aldehydes (Eq. 9). Acyl bromides must be used because chloride ion (a byproduct of ketene generation from acyl chlorides) poisons the catalyst. In addition, the solvent benzotrifluoride must be employed so that trialkylammonium bromide, which promotes ketene dimerization, precipitates out of solution as it forms. A model accounting for the observed sense of enantioselectivity posits that the aldehyde assumes an apical position in a roughly trigonal bipyramidal complex, with its hydrogen pointing upward toward the catalyst. Ketene-imine cycloadditions generally require an imine that is both highly electrophilic and non-enolizable. The benzoate catalyst 7 promotes [2 + 2] cycloaddition of in situ-generated ketenes with α-imino esters. Proton Sponge is used as the base for dehydrohalogenation, and a Lewis acidic indium(III) co-catalyst improves yield while decreasing cis/trans selectivity (Eq. 10). Very electrophilic dienes such as o-benzoquinones and the corresponding diimines are generally required in [4 + 2] cycloadditions of ketenic dienophiles. Lewis bases catalyze these reactions via addition at C1 of the ketene in a manner analogous to their mechanism in [2 + 2] cycloadditions (Eq. 11). Conjugated vinyl ketenes participate in formal [4 + 2] cycloadditions as electron-rich dienes. The substrate scope of this class of reactions is severely limited: only chloral and aryl aldehydes may be employed as "dienophiles" (the reaction mechanism is not pericyclic). Excess Lewis acid presumably aids in dehydrohalogenation leading to the formation of vinyl ketene from 3-substituted crotonyl chloride precursor (Eq. 12). Ketene [2 + 2] cycloadditions with aldehydes are useful for the iterative installation of propionate units. After formation of a β-lactone via ketene-carbonyl cycloaddition, ring opening affords products of aldol addition and may unmask a new carbonyl group amenable to cycloaddition. For example, a synthesis of (–)-pironetin employed catalytic asymmetric cycloaddition to establish two adjacent propionate units (Eq. 13). The configuration of the product of the first cycloaddition is mediated by the catalyst, but the second cycloaddition benefits from matched substrate and catalyst control of stereoselectivity (double diastereoselection). The products of ketene dimerization, 4-alkylidene-2-oxetanones, are masked β-keto amide enolates. Ring opening with a nucleophile unveils the hidden enolate. For example, a synthesis of siphonarienedione used this strategy to establish a key carbon-carbon bond via aldol addition (Eq. 14). Catalytic asymmetric ketene cycloadditions are distinct from methods that employ a chiral auxiliary in the ketene or ketenophile. The latter methods require additional synthetic steps for the installation and removal of the auxiliary, and may operate by uncommon mechanisms owing to the steric bulk or electronic character of the auxiliary. For example, chiral hydrazones employed for ketene-imine cycloadditions react via an electrocyclic mechanism (Eq. 15). Application of the enantioselective aldol or Mannich reaction followed by ring closure affords β-lactones or -lactams, respectively. For example, Reformatsky reaction of an α-bromo imide followed by ring closure yields β-lactams in moderate yield and enantioselectivity (Eq. 16). 1,3-Dipolar cycloaddition of nitrones and alkynes yields isoxazolines. When the alkyne is converted to a copper acetylide prior to cycloaddition, ring contraction occurs to produce a β-lactam. This method, known as the Kinugasa reaction, is an alternative to ketene-imine cycloaddition. Yields are generally lower than comparable ketene-imine cycloadditions, but enantioselectivity is high when chelating diamines such as 10 are employed. Ketenes are highly reactive and in most cases must be generated immediately prior to use. An important exception is trimethylsilylketene, which is stable under ambient conditions and commercially available. The most general reactions employ ketenes generated in situ via dehydrohalogenation of acid chlorides. Bulky amine bases are typically used to accomplish dehydrohalogenation, as unhindered amines tend to add to the ketene. Slow addition of the ketene precursor to a solution of the ketenophile is often used to minimize ketene dimerization. Enolizable imines must be generated in situ to avoid tautomerization to the corresponding enamines. To a solution of O-trimethylsilylquinine (1, 40 mg, 0.10 mmol, 10 mol %) and LiClO4 (53 mg, 0.5 mmol, 50 mol %) in Et2O (1.0 mL) was added CH2Cl2 (2.0 mL) and the reaction mixture was cooled to –78 °C. To the resulting mixture was added N,N-diisopropylethylamine (0.44 mL, 2.5 mmol) followed by hydrocinnamaldehyde (0.13 mL, 1.0 mmol). A solution of propionyl chloride (0.17 mL, 2.0 mmol) in CH2Cl2 (0.5 mL) was then added over 1 h by syringe pump. The reaction mixture was stirred for 7 h, quenched at –78 °C with Et2O (10 mL), and the resulting mixture was filtered through silica gel eluting with Et2O (3 x 20 mL). The filtrate was concentrated under vacuum and the crude product mixture was purified by flash chromatography (10% EtOAc in hexane) to give the product shown (161 mg, 84%) as a colorless oil. Separation of enantiomers by chiral HPLC [(Daicel ChiracelTM OD-H column, 1.0 mL/min, 2-propanol/hexane = 5:95) Tr (3S,4R) = 12.9 min, tR (3R,4S) =14.0 min] provided only one enantiomer (3R,4S) (>99% ee): [α]D – 47.2 (c 2.04, CHCl3); IR (thin film) 1821, 1455 cm–1; 1H NMR (300 MHz, CDCl3) δ 7.34–7.21 (m, 5H), 4.59 (ddd, J = 10.5, 6.4, 4.1 Hz, 1H), 3.76 (qd, J = 7.8, 6.5 Hz, 1H), 2.90 (ddd, J = 13.8, 9.4, 5.3 Hz, 1H), 2.72 (ddd, J = 13.8, 8.8, 7.5 Hz, 1H), 2.13–1.97 (m, 2H), 1.29 (d, J = 7.8 Hz, 3 H); 13C NMR (75 MHz, CDCl3) δ 172.3, 140.4, 128.6, 128.4, 126.4, 74.6, 47.2, 31.9, 31.5, 8.1; HRMS (m/z): M+ calcd for C12H14O2, 190.0994; found, 190.0990. ↑ Woodward, R. B.; Hofmann, R. Conservation of Orbital Symmetry; Verlag Chemie: Academic Press: New York, 1970. ↑ Zimmerman, H. E. Acc. Chem. Res. 1971, 4, 272. ↑ Lecea, B.; Arrieta, A.; Lopez, X.; Ugalde, J. M.; Cossio, F. P. J. Am. Chem. Soc. 1995, 117, 12314. ↑ Pons, J.-M.; Oblin, M.; Pommier, A.; Rajzmann, M.; Liotard, D. J. Am. Chem. Soc. 1997, 119, 3333. ↑ Pacansky, J.; Chang, J. S.; Brown, D. W.; Schwarz, W. J. Org. Chem. 1982, 47, 2233. ↑ Qiao, G. G.; Andraos, J.; Wentrup, C. J. Am. Chem. Soc. 1996, 118, 5634. ↑ López, R.; Sordo, T. L.; Sordo, J. A.; González, J. J. Org. Chem. 1993, 58, 7036. ↑ Martin-Zamora, E.; Ferrete, A.; Llera, J. M.; Munoz, J. M.; Pappalardo, R. R.; Fernandez, R.; Lassaletta, J. M. Chem. Eur. J. 2004, 10, 6111. ↑ Danishefsky, S. J. Chemtracts 1989, 273. ↑ Evans, D. A.; Siska, S. J.; Cee, V. J. Angew. Chem., Int. Ed. 2003, 42, 1761. ↑ Bennett, D. M.; Okamoto, I.; Danheiser, R. L. Org. Lett. 1999, 1, 641. ↑ a b Zhu, C.; Shen, X.; Nelson, S. G. J. Am. Chem. Soc. 2004, 126, 5352. ↑ Calter, M. A.; Orr, R. K.; Song, W. Org. Lett. 2003, 5, 4745. ↑ Lv, H.; Zhang, Y.-R.; Huang, X.-L.; Ye, S. Adv. Synth. Catal. 2008, 350, 2715. ↑ Evans, D. A.; Janey, J. M. Org. Lett. 2001, 3, 2125. ↑ Nelson, S. G.; Zhu, C.; Shen, X. J. Am. Chem. Soc. 2004, 126, 14. ↑ Taggi, A. E.; Hafez, A. M.; Wack, H; Young, B.; Ferraris, D; Lectka, T. J. Am. Chem. Soc. 2002, 124, 6626. ↑ Bekele, T.; Shah, M. H.; Wolfer, J.; Abraham, C. J.; Weatherwax, A.; Lectka, T. J. Am. Chem. Soc. 2006, 128, 1810. ↑ Tiseni, P. S.; Peters, R. Org. Lett. 2008, 10, 2019. ↑ Shen, X.; Wasmuth, A. S.; Zhao, J.; Zhu, C.; Nelson, S. G. J. Am. Chem. Soc. 2006, 128, 7438. ↑ Calter, M. A.; Liao, W. J. Am. Chem. Soc. 2002, 124, 13127. ↑ Díez, E.; Fernández, R.; Marqués-López, E.; Martín-Zamora, E.; Lassaletta, J. M. Org. Lett. 2004, 6, 2749. ↑ Yuan, Q.; Jian, S.-Z. ; Wang, Y.-G. Synlett 2006, 1113. ↑ Lo, M. M.-C.; Fu, G. C. J. Am. Chem. Soc. 2002, 124, 4572. This page was last modified on 5 September 2013, at 03:36.